For any business organization, generating documents is an essential requirement. Generated documents can be in the form of contracts, proposals, notices or any information. Through DocParser, a user can create WordDoc or PDF which can show relational information from a built-in or custom module. It gives an option to create multiple templates for branding and easy to generate document as and when needed through parsing those templates. It allows a user to create an informative(Attractive) template to parse information, which can be used for multiple time. Easily generate WordDoc or PDF from any module. DocParser allows to either download document or relates it within SuiteCRM's Documents module. Generated WordDoc/PDF can also include the records from a relational module. 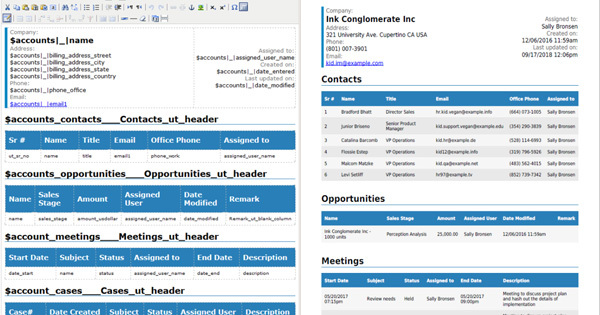 For example, we have a template for Contact module with information about related Meetings, Tasks or Cases. Now, when you want to have all the information in single Word/PDF, you just need to download a document from DetailView of that particular Contact's profile. Users will have a button on DetailView from where he will have the option to choose Word Doc, PDF or relate it with SuiteCRM's Documents module. 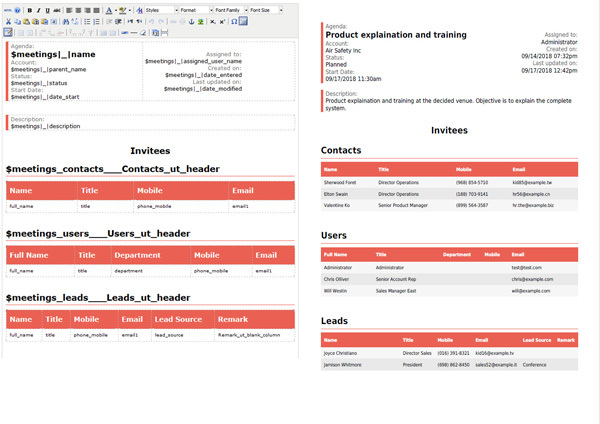 Here are some sample of doc parser template and with a generated document. See how straight-forward and easy to use this add-on is with our detailed user guide. We are here to help. Just let us know how we can help.